Sealed batteries, particularly the AGM (Absorbed Glass Mat) battery, is becoming increasingly popular for off-grid applications and have always been preferred in RV or trailer applications due to their safety attributes. The AGM battery is a lead acid battery, but unlike its traditional counterpart it is sealed tight and offers a number of advantages that more and more users are recognizing. Sealed batteries with their technology advancements are capable of good performance in many demanding applications from RV battery power to off-grid living. While every charge / recharge cycle reduces the life of a battery, and while regular occurring deeper discharges will worsen the overall cycle life, substantial improvements have been made to some of the AGM sealed batteries designed for deep cycle use. Note: The estimates above depend on good storage conditions and proper charging. 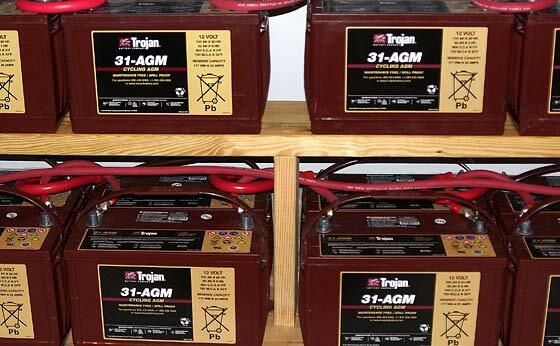 Note: Trojan Battery Company is not an advertiser with us. Note: I use these batteries for my solar-powered battery bank which keeps the house “powered” when the sun goes down or during very cloudy or stormy days. They are 12-volt batteries which I have configured in groups of four in series (48-volt), each group then being tied in parallel to create an adequate reserve of storage capacity. This is a substantial attribute of AGM sealed batteries. Because they are sealed and release no dangerous gases while charging, they are safe to keep indoors, in the RV, or in your trailer as a power source. 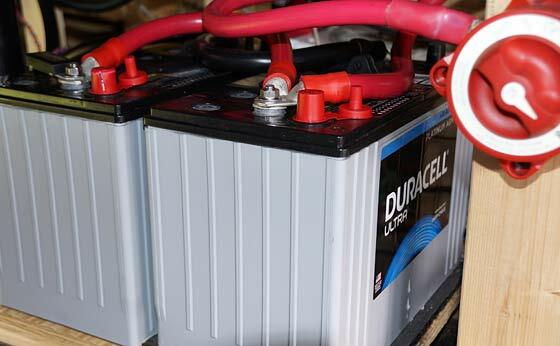 Other batteries require proper enclosure and ventilation of those gases. Because they don’t leak, they won’t contaminate or corrode battery terminals. This is particularly important in any off-grid application where good connectivity (and longevity thereof) is essential for proper system balance and performance. Because they are sealed, there are no hazardous materials costs and shipping restrictions for these batteries. When I purchased my batteries, I drove to a dealer with the truck, however for some of you this may be an advantage. Again, because these batteries are sealed and are filled with “all glass mat’ (rather than liquid) they can be mounted in any orientation without issue. I have been experimenting with another 12-volt AGM sealed battery, the Duracell Ultra deep-cycle marine. This particular branded battery is actually made by DEKA (part of East Penn Manufacturing) here in the United States, one of the largest battery manufacturers in the world. To be fair, I also want to point out the drawbacks. 1. They are lots more expensive than traditional flooded lead acid batteries. As much as double. 2. They can be damaged from overcharging, so attention must be given to charging parameters and the right charger for the job. Are you going to do an article on the proper charger(s) for the AGM batteries? Plan on printing this article out for the neighbor, he has solar panels waiting to be set in place but the batteries have been an issue for him. @Antique Collector, Yes I suppose I could at some future date… although these types of tech articles are ‘boring’ for many of the regulars (grin). Some of us seniors are electronically and mechanically challenged. We do not find these articles boring; it is just that we don’t understand them. It’s not that we find some of the articles ‘Boring’; it’s that I have NO clue as to what yar talking about. Speaking of not understanding, who the heck IS John Galt anyways???? Guess I’ll find out this longggggggggg weekend. Speaking of Batteries, your saying you got your ‘full’ buy-back PV system in for $7K at 28-kWh, WITH AGM’s? Holy-Popcorn-Batman, that’s a hell of a price for that size system. Ohhhh that’s right, get me all fired up on .gov spending…. There ya go. GERRRRRRRRR, as I sit here doing Change Orders for more crapo the local County Fire Dept. wants as ‘fluff’….. It has been about 15 years since I was a member of a fire department – I’m afraid to ask what what our services have become – when I started, you could ride on the tail step clipped onto a bar. You had to have a hose tower because the hoses needed to dry as compared to the synthetics today. That is just a small sample of the changes – but some safety changes have saved lives – you don’t need to be smoke eater in structural fires anymore. My system is not considered large – I call it medium… so something to power a ‘typical’ home today would require more (especially if designing for off-grid). Also, although the system capacity stores 28 kWh, you never want to go below 50% else risk battery damage. Once in awhile is okay, but not regularly. So effectively I have a storage capacity of about 10 – 11 kWh (35% depth-of-discharge – or 65% state-of-charge) which will maximize the cycle life of the battery bank itself. During the winter though, I put some circuits back on grid (not enough sunlight up here in the north country during the winter!) Although I do have enough ‘juice’ to run all my essential systems year-round. Don’t think of what I say as condescending but a simplification of the solar system in terms of water collection system. If you put some water collecting trays on the roof, connect them to several toilets, the tanks will stop filling automatically when full of water. Then you can use the water as needed until the tanks are empty. If it does not rain for a while, you might have to start a generator to power your well pump to fill the toilets. The solar system works somewhat the same but use some electronics to govern the fill of the batteries. Ken, The articles are not boring, but some of us who have no exerience in certain areas, need to read, re-read and digest said material..before we can even make a sensible question. I have not watched the battery story too closely but keep hearing that big strides in this technology are expected due to the push for electric cars. Do you see any major improvements on the horizon? I hate being on the tech treadmill with a new phone, operating system, software update, server, … coming out every year. It is to the point where I just wait for a while to see if the improvements are real and are verified by many consumers. Each upgrade I make seems to be problematic and I guess by your recent upgrade experience, you are in the same boat. Just read up on some of the specs of the Trojans and see they can be installed on their sides (not only upright). This would allow for more vertical stacking, better access to wiring, and easier to handle (if there was a handle). They do have a handle. If one wanted to stack these units on there sides, why not construct a shelving unit. This unit would only be deep enough to hold the battery/batteries, construction standards of canning shelves. One then could expand the amount of batteries in their power storage. And that is exactly what I do, although they sit upright as pictured above. Ken, I did not mean stacked on one another but on shelving units closer spaced as AC has suggested. So, rather that a wall use of eight feet for a double stack, you could use four feet (appox) but five-six feet high. @hermit us, Tesla is working on Lithium-Ion battery technology and they have apparently made great strides. One issue at this time is the high cost of implementation. Tesla is marketing a home battery system (PowerWall) which currently / apparently delivers 14 kWh of stored energy and costs approximately $12,000. As a comparison, my current battery bank will store 28 kWh and cost about $7,000. Twice the energy for almost half the price, and I have AGM’s which themselves are expensive! As yet a further comparison, I could have instead purchased a similar storage capacity using flooded lead acid batteries (e.g. Trojan T-105) for about half of what I paid (although I would have had to deal with the issues associated with this type of battery). Ken, that fire hazard from lithium-ion could make short work of my house – if they have not corrected this problem. Maybe I’ll stick to the “old” tech for now. Yes, that is a concern for sure. That said, my understanding is that the lithium batteries that were going up in flames were cheaply manufactured in China. There are specific manufacturing issues that must be upheld when building these batteries. No shortcuts… I would presume that companies like Tesla (and other reputable companies) would be building them right. Although time will tell. Forgive Me. What is SOC ? And the spec sheet is saying to charge them in a vented area. Lawyer Talk ? Another commonly used notation is DOD (Depth Of Discharge) which is 100% minus SOC. A battery that has a state of charge (SOC) of 70% also has a depth of discharge (DOD) of 30%. Regarding what you saw in the spec-sheet, “Do not install or charge batteries in a sealed or non-ventilated compartment.” it’s probably LT (Lawyer Talk). That said, they’re referring to a “compartment” eluding to a very tight and/or sealed space. Maybe heat related – although my experience has been that the batteries do not get too warm at all upon recharge. They’re probably covering their behind. AGM’s by their design do not off-gas. This is why they are used in applications where off-gassing would be an issue. Soc, State Of Charge. I believe, and vented while charging is usually to cool. I’ve used the Deka AGM batteries for several projects,some several years old. Rock solid as far as performance and reliability. And like Ken mentioned, improvements seem to be daily. Chargers are the big factor, don’t skimp here. Or your excellent battery choice will be trashed. @Otarn, You are so right regarding chargers, and setting proper parameters (for those chargers that allow this). When you spend big bucks on a battery bank, you better be sure that you’re charging it right – else lots of money down the drain. I’ve long been a practitioner of low voltage subsystems at my home and camp. The Deka/Duracell AGM’s have served me quite well so far. I have a 10 battery bank at home (float charged from grid power w/ solar backup), a 10 battery bank at camp (solar charged, or from the 200amp alternator in my truck when needed) and a 4 battery bank in the custom built motor home (alternator and solar charged). I’ve run a variety of wet cell batteries in the past, but despise the maintenance… especially in winter. Total invested in just the 12v/105ah AGM batteries is right around $5K, but so far no regrets on the investment. Thanks for the report regarding the Deka/Duracell AGM’s. When I first looked at them and checked them out, I was happy to discover that they’re made by Deka – here in the U.S.
Has anyone ever used full-spectrum lights in order to supplement charging, or would that just be defeating the purpose? I forgot to ask if you convert all your power needs through your inverter or if you have any circuits that are 12 or 24 v? Would you have had more low voltage lighting or appliances if you were to do it over again? I’m not sure of the efficiency loss through the conversion to the higher voltage as opposed to the loss in low voltage transmission throughout the house/out buildings (for that short distance, I do not think line loss would matter). For the house, I convert my DC battery bank (48-volts DC) to 120-volts AC through an Outback inverter, for everything. I have no low-voltage appliances in the house. One thing about low voltage DC is that it requires some hefty wire/ cable to accommodate the potentially higher current demands (depending on the appliance). I feel that the efficiency of the AC inverter is pretty good. For the RV I also convert my battery bank (12 vdc) to 120 vac through a ‘Magnum Energy’ charger/ inverter. There are lots of DC circuits in an RV/ trailer and I can run them from the battery bank or through a DC converter. Thanks for the info. I too have an RV with a similar system and that is what got me thinking about any new construction I do – regular wiring or low voltage – perhaps just for lighting, estimated to be around 12% of residential power consumption. I have converted every light bulb in the house to LED. It made a HUGE difference. Watch ZAFF battery for new chemistry that could replace lead acid. Should be out soon.